Read my full review on Sassi Sam. Lola is almost a book about nothing nothing much but it is a brilliant portrait of an 'ordinary' women. Based on Lily Brett's life as a young journalist for an Australian rock magazine, the novel opens with Lola interviewing Jimi Hendrix minutes after an early gig. She travels in London and the US, interviewing some of the most incredible musicians of the 1960s. From there, the novel skips over the decades of Lola's life, drawing a slow portrait of a women who lives a life any of us could. What separates Lola from the mass of people is her parents, both of whom are Auschwitz survivors. This novel is a fascinating look at what it is like to be the child of holocaust survivors – a notion almost none of us would be able to comprehend without books such as this – and how being the child of a survivor affect you, in ways that can never be imagined. 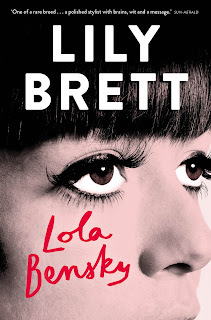 Lola Bensky is a novel with a difference and an excellent read that I would heartily recommend.